The use of acellular dermal matrix eliminates the need to use tissue from the top of the mouth to the area needing gum grafting. Acellular dermal matrix is a purchased material that is eventually replaced with your own tissue as it heals. Acellular dermal matrix is a sterile human connective tissue matrix that contains no blood and no cells. All cells are removed. Therefore, there is no risk of rejection or potential for disease transmission. This tissue matrix has been in use in medicine and dentistry for over ten years, and there have been no cases of disease transmission in over 500,000 transplants. 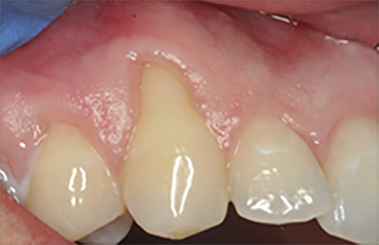 This technique allows for more teeth to be treated in one session. After healing, your gum tissue is bound down tightly to the underlying bone and to the teeth keeping it in place and preventing future root exposure. Roots that are exposed and sensitive can be covered improving esthetics and reducing or eliminating sensitivity. Call Dr. Wiland today to make an appointment for soft tissue grafting without using your own tissue. Treatment time is only about 1 hour for most procedures. 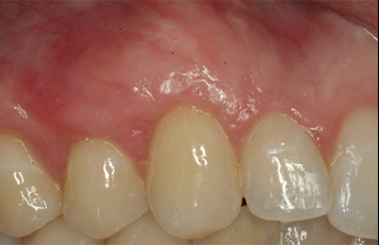 Pain is minimal and the cost of treatment is about the same as with traditional gum grafting. Many people do not remember the procedure when sedation is safely used. The recovery time or healing time is usually the same or less than traditional treatment techniques. Be sure to visit the photo gallery to see before and after photographs. ● Consistent quality of donor tissue. The results are predictable. ● The results look great. After a short healing time, there is a natural aesthetic appearance. No one can tell that the area has had a graft.